Here's the back workout you've been missing. Its efficacy comes from your dedication to making each rep count. Do it right, and you'll reap serious results! A big back and great biceps are hard to come by. According to James Grage and Whitney Reid of BPI, that's because most people don't realize how much work it takes or how much quality reps matter over heavy weight. "To build a big back, you have to do a lot of different exercises and a lot of volume," says Grage. "Your back is a huge muscle group, so a good workout should be exhausting. If you're not walking out of your gym completely exhausted after a back workout, then you're not going hard enough. I think a lot of it just comes down to effort." Grage also suggests that to increase the size and develop the shape of your back, you need to hit everything with good form. "It took me a long time to grow my back because I was just using assisting muscles to sling heavy weight, not my back," he says. "It was more about the weight of the rep rather than the quality. You have to focus on the contraction and the quality of the contraction, not on the amount of weight you're pulling." "I'll say the same thing for biceps. It's all about the quality, the squeeze. It doesn't matter how much weight you can curl." Although Grage and Reid are full of great information, they like to show rather than tell. So, the two are going to smash an intense back and biceps workout. Watch them to learn technique tips and workout strategies, and then hit the workout yourself! When you're doing rows, lat pulldowns and the like, remember to use your back, and not your biceps or rear delts, to do the movements. "I like to pretend that my arm between my hand and my elbow is a hook—I pull from my elbow and not my hand," explains James. "Your biceps are small, so you'll smoke them before you do your lats." Keep that tip in mind as you go through this workout. Do it right and you'll feel your back working like never before. "The thing I like about pull-ups is that it's a nice way to warm up without overdoing it," says Grage. "You can't load it up too heavy on pull-ups. It's a good way to pre-work the lats before you really get into training them." "I see a lot of people cheating this by swinging backwards and using momentum. Keep your back upright and pull your elbows as low as you can. I like to add a nice little squeeze at the bottom. It's all about that quality contraction. Make every one count," says Grage. "Keep your back upright and pull your elbows as low as you can. I like to add a nice little squeeze at the bottom. It's all about that quality contraction. Make every one count." "For the final set you'll do partials. To do them, drop the weight down. For one rep, you'll pull all the way to the bottom, squeeze, and then move the bar part way back up—your lats will have to act as a break—then squeeze, and bring it back down. Then, you can move the bar all the way back up." "This technique puts a lot of stress on the muscle," he adds. "There's no cheating this one." "Cables keep constant tension on your back, so it's great to use as a pre-exhaust exercise before you hit the dumbbell rows," says Reid. Be sure to pull from your elbow, not your hands. Keep your biceps out of the movement. "Dumbbell rows are great because you can get a stretch," says Reid. "Pull the weight right into your pocket. That way you'll use less biceps and more lats." 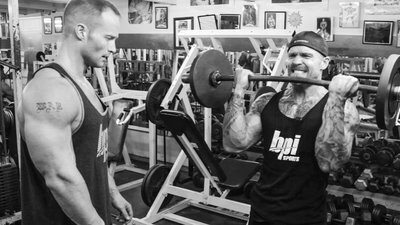 "If you pull your elbow straight up like I see most people do," says Grage, "you're using more biceps and rear delt than lat." "The pulldowns are great because they're similar to doing dumbbell pullovers, but I think you get a better range of motion," says Reid. "This variation uses a rope instead of a straight bar. The advantage is that your range of motion is not limited to your thighs. You can pull back a little further." "For the low pulls," says Grage, "pull the rope low toward your hips. Keep your chest high and your chin up. If you start to bend forward, you end up using your chest and triceps to push rather than pull." To do 21s, start off with 7 full reps. Then, do 7 reps from the top to the midway point, and finish with 7 reps that go from the bottom to the midway point. "Little things, like the pause on the second set of 7 when you actually have to stop the rep half way through, will put a lot of stress on the muscle. That's the kind of stuff that's really going to break down the muscles and make them grow." By now you're probably starting to get really fatigued. Keep going. Make every rep count. "Keep your thumb over top of the bar," says Grage. "You can't go heavy on these. There's no need to. We've done so many different pulls for back, your forearms are already going to feel exhausted." "Run the rack" means you'll start with a heavy pair of dumbbells, do as many reps as you can with them, then grab the next lightest pair and do as many reps with that weight as you can. Keep going lighter. Essentially, it's a dropset, but you're doing multiple drops. Take each set to failure." "Run the rack" means you'll start with a heavy pair of dumbbells, do as many reps as you can with them, then grab the next lightest pair and do as many reps with that weight as you can. After you're done training, make sure you make time for recovery. "You come into the gym and break your muscles down, but then you have to go home and recover with sleep, nutrition, and supplementation," says Grage. "Get your BCAAs, protein, and carbs. It's in the recovery process that you grow, not in the gym. If you don't make time to rest, then you'll eventually break down muscle."